Yes, that’s right, TOWIE is back and in this guide I’m going to show you how you can watch it from anywhere in the world! The Only Way is Essex is essentially the original ‘reality TV’ show. It has spurned many copies and launched the careers of countless regular people who just happened to live interesting enough lives that millions of us wanted to view. 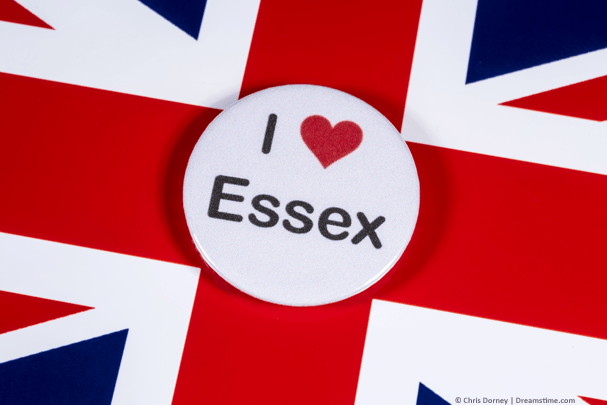 However, although TOWIE is hugely popular in the UK it isn’t known so much abroad and so finding a TV channel that shows The Only Way is Essex is near impossible. However, by using an app called a ‘VPN‘ you can access the ITV service from the UK in any country and watch TOWIE anywhere. Below I’ll show you how easy it is. The first thing you’ll need to do is grab yourself a VPN service. A VPN allows you to unblock the ITV Hub website or app outside the UK. If you try to access outside the UK without using a VPN you’ll be blocked. When using a VPN you can watch TOWIE in America, Australia, Canada, Spain or anywhere else in the world. There are literally hundreds of companies who offer VPN services but my recommended choice is ExpressVPN. They’re a bit easier to use than the rest and they’ve got a 30-day money back guarantee in case you can’t get it working. If you want to shop around however then the following 3 are all good for watching TOWIE abroad. 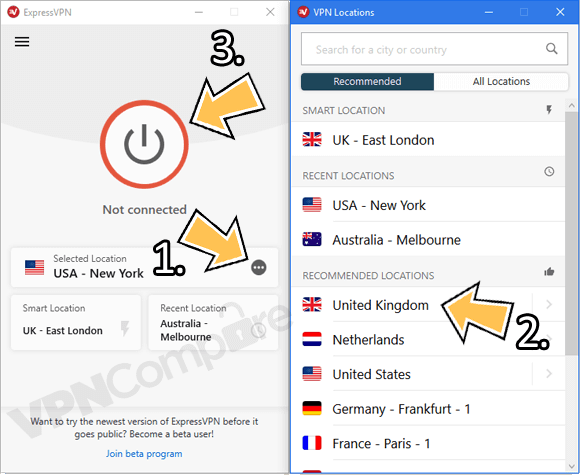 ExpressVPN – My top choice! Once you’ve decided on one of the above just click on their name and sign up for their service. If you’re outside the UK for some time, such as an expat, backpacker or working abroad then it’s worth signing up for ExpressVPN’s 12-month package. It comes with 3 months totally free making the price 49% cheaper than if you paid monthly. Now you’ve got yourself a VPN service follow the steps below to watch TOWIE abroad. To watch TOWIE abroad you’ll need to follow the simple steps below. I’m using ExpressVPN in my example but you can use any of the providers from above. Skip the first step if you’ve already signed up. Go to the ‘Products’ area of their website and download their app for your device. Open the app and login. Press Choose Location (1) and then press United Kingdom (2). Once it’s connected visit the ITV Hub website or open the ITV Hub app. Watch TOWIE abroad with ExpressVPN. Here you’ll be able to search for The Only Way is Essex and watch either live at the same time it’s shown in the UK or on catch-up TV. Just take a look at my example video below to see how easy it is to use the VPN to watch TOWIE abroad. If you’re still a little unsure and think this will be really complicated, take a look at my example video below. I’m using a Windows PC with ExpressVPN but it’s just as easy if you’re using a mobile, tablet or other device too. As you can see above it’s really easy to watch TOWIE abroad and by following the 6-simple steps above you can be watching in minutes. Does this work on my mobile, tablet or Amazon Fire TV Stick? The above method works on regular computers and laptops running Windows or Mac OS which is probably the easiest method. You don’t need any additional apps apart from the ExpressVPN app. If however you want to watch on your mobile phone or tablet then it’s really easy too. First, you’ll need to download the ExpressVPN app using the steps above. Once you’ve downloaded it and connected to the UK then open the ITV Hub app on your mobile or phone. You can then watch TOWIE abroad. This will also work for the Amazon Fire TV and Fire Stick too. So if you’ve got the ITV Hub app installed on your Amazon device you can simply install the ExpressVPN app, connect to the UK and then use the ITV Hub app to watch. Watching TOWIE abroad is a lot easier than you first might think. Whatever device you want to watch on you’ll need to get yourself a VPN service. I recommend ExpressVPN as they work with most devices including Windows and Mac computers and laptops, Android and iOS mobile phones and tablets and the Amazon Fire TV and Fire Stick. Click the button below to visit the ExpressVPN website and sign up for their service. Consider signing up for their 12-month package because it’ll save you 49% over paying on a monthly basis and allow you to watch the entire series of TOWIE and other programmes too. Once you’ve signed up, download their app and connect to the UK. You can then visit the ITV Hub website or use the ITV Hub app and watch TOWIE either at the same time it’s shown in the UK or on catch-up. Who’s your favourite TOWIE character and where are you watching this series from? I would love to know so why not tell me in the comments section below?